Chicken Gizzard (also known as Iresine Bloodleaf Plant) is native to Brazil and is an unusual, ever-colorful plant. It has glossy, oval leaves that measure 2 1/2 inches across and are sure to set you apart from the competition. Chicken Gizzard makes a great-looking houseplant, but they can live outside as an annual (or a soft perennial in frost-free zones 10 and 11). These plants can reach heights up to five feet tall, but when grown in a container as an annual you should expect 12-18 inches of growth. 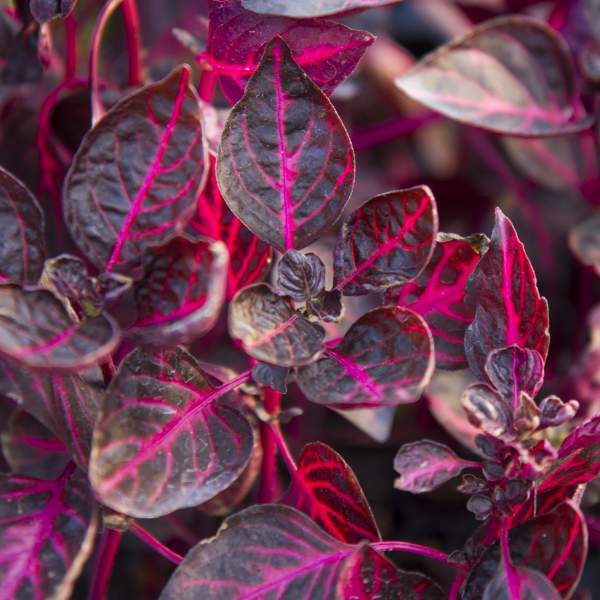 The colorful leaves make it a great choice for combination planters or stand-alone baskets. For best results with Chicken Gizzard, use a constant-but-low feed program of 150-200 ppm N. A pH between 6.0 and 6.5 is important for the healthiest plant color. Chicken Gizzard need to be pinched. First pinch should be 5-10 days after transplanting to your final container (once the plant is well established).Chicken Gizzard tend to get leggy, so proper pinching is a must when internodal growth gets too long. You can also encourage compact growth by staying toward the bottom end of the fertilizer range. With proper pinching, Chicken Gizzard plants can be successfully grown in an 1801 or other market tray. For 4" pots and larger, space pots as needed for pot size to allow air flow and penetration of light. Plant growth regulators are not necessary for Chicken Gizzard as long as proper pinching is observed. Spider mites and occasionally mealybugs are the pests to watch for with Chicken Gizzard. Iresine Chicken Gizzard Red is not prone to many diseases, but don't oversaturate the soil. If the plant sits in moist soil for an extended amount of time, you could end up with root rot or botrytis. Botrytis grey rot is usually associated with wet or humid conditions. You can prevent botrytis by allowing the plant to dry out between waterings, allowing for good airflow in your greenhouse, and spacing to allow the sun to penetrate to the soil level. The most common chemicals used to treat botrytis and root rot are Medallion and Banrot. Use them as a drench according to each label's instructions. We recommend planting 4-5 starter plants per 10 inch basket. Use a well-drained soil in your baskets and plant your starter plants deep, allowing the ellepot to be completely covered by the soil. If you are planting 4" pots, 1 plant per pot should be sufficient. Plant them directly in the middle of your pot.